For the 24 hours to 23:00 GMT, the EUR declined 0.12% against the USD and closed at 1.0562 on Friday. In economic news, French consumer confidence index remained steady at a level of 100.0 in February, in line with market expectations. In the US, data indicated that new home sales rebounded 3.7% on a monthly basis, to a level of 555.0K in January, suggesting that housing market is regaining momentum. Meanwhile, market expected new home sales to rise to a level of 571.0K, following a revised level of 535.0K in the prior month. Meanwhile, the nation’s final Reuters/Michigan consumer sentiment index was revised higher to a level of 96.3 in February, compared to a preliminary print of 95.7. However, the index dropped from a thirteen-year high level of 98.5, recorded in the preceding month, declining for the first time since the US Presidential elections. In the Asian session, at GMT0400, the pair is trading at 1.0561, with the EUR trading marginally lower against the USD from Friday’s close. 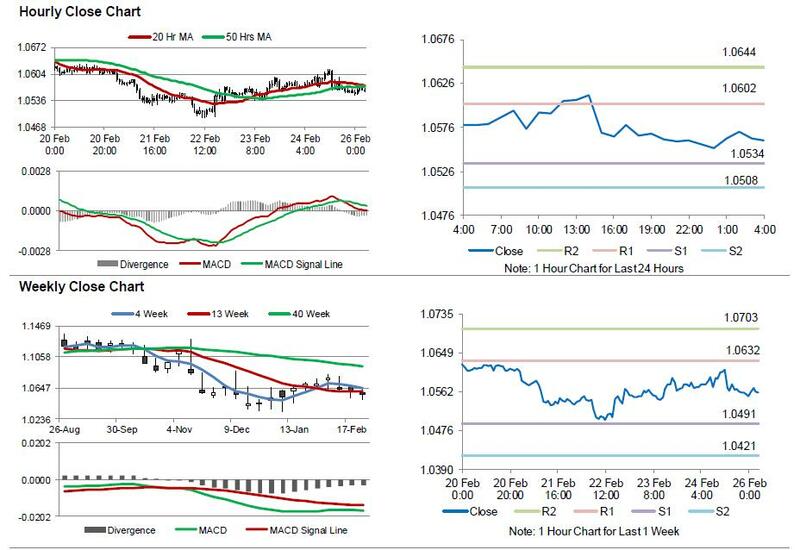 The pair is expected to find support at 1.0534, and a fall through could take it to the next support level of 1.0508. The pair is expected to find its first resistance at 1.0602, and a rise through could take it to the next resistance level of 1.0644. Going ahead, investors will look forward to the Euro-zone’s final consumer confidence index for February, scheduled to release in a few hours. Also, the US flash durable goods orders and pending home sales data, both for January, slated to release later in the day, will garner a lot of market attention.